There are so many women who desire to become natural without having to do the "big chop". 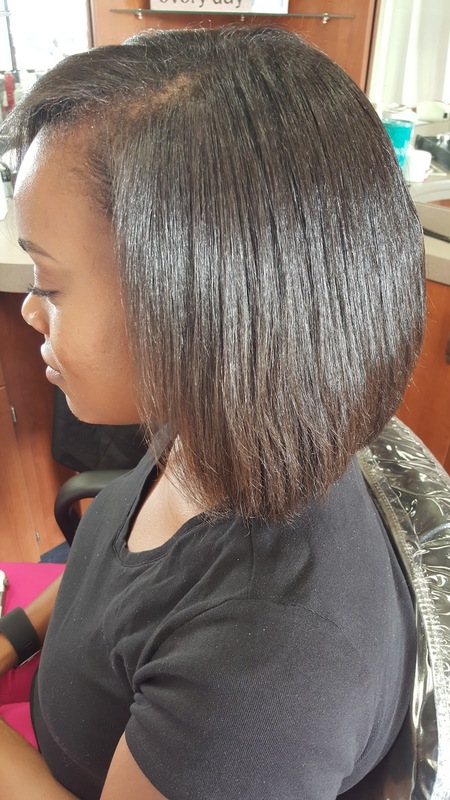 These women simply want their hair to grow out to a point where they feel comfortable enough with cutting the relaxed ends off. This is called transitioning. 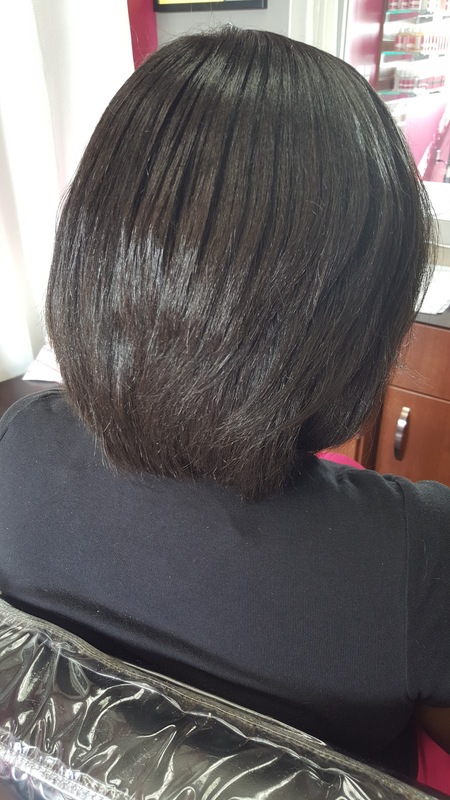 This client had hair that came past her shoulders. 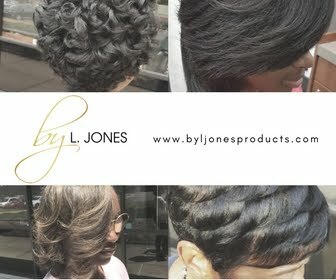 She has been transitioning for a little over a year now and says she is tired of having two different textures of hair. Half of her hair is in its natural state and the other half is straight from having a relaxer. She wanted to cut the relaxed ends off but was extremely nervous about how it would look. I suggested that we do a bob, that way she would have a style to her hair. Her main concern was that she would not be able to put it in a ponytail anymore. She also wondered about how much it would shrink up after it was wet once it was cut. 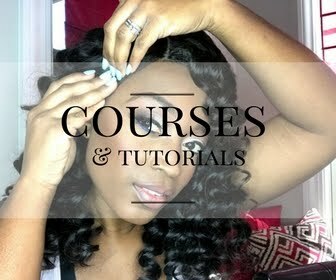 Today I have 3 secrets to help you transition from relaxed hair to natural hair. 1. First, see how much you are working with. Some natural women do this by stretching a small piece of hair out and seeing how much straight hair is on the ends. Don't do this! Doing it this way does not really give you a clear picture of how much you will be cutting. 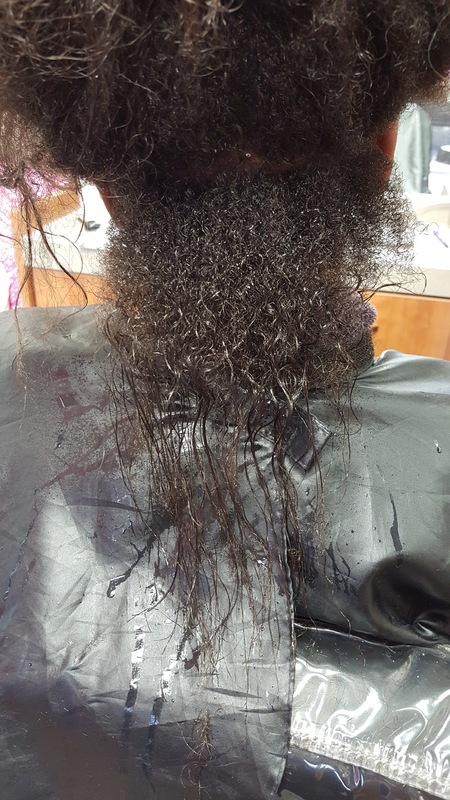 In the picture below, I actually took a section and combed it out from root to end. As you can see in the picture below there looks like much more straight hair than in the picture above. 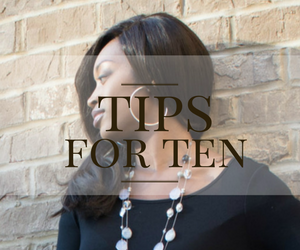 Seeing how much really needs to be cut will let you wrap your mind around how much hair you can expect to come off. 2. Take off a little at a time. If you are not ready to cut all of the relaxed ends off, take a little bit at a time. I would suggest doing more than a regular trim but less than a full on big chop. Doing this on a regular basis will help to not make it such a drastic change all at once. This client was getting trims regularly but once she got to this point she said she wanted to be done with the relaxed ends so we went for it at this appointment. 3. Don't be afraid to cut more than your normally would. 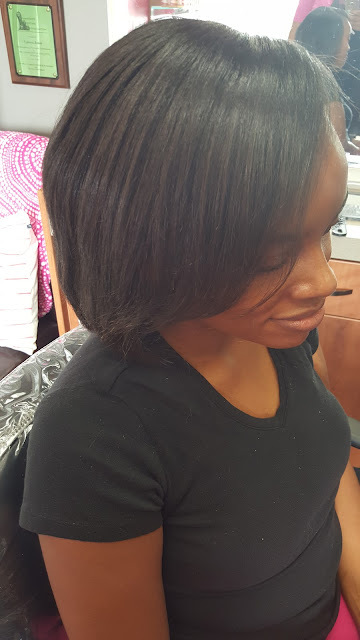 With this client, I blew her hair out first before cutting to get a more precise cut. 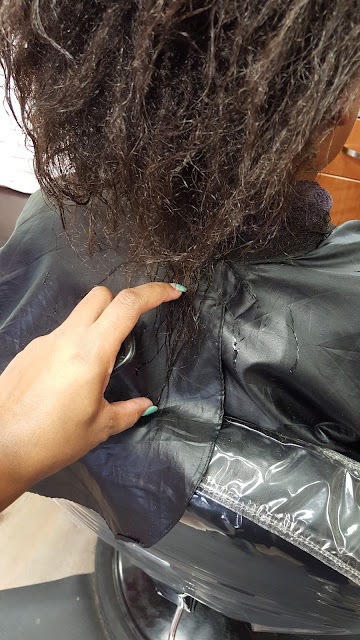 As I got closer and closer to blowing out all of her hair she became more and more nervous about her decision to cut the rest of the relaxed hair off. 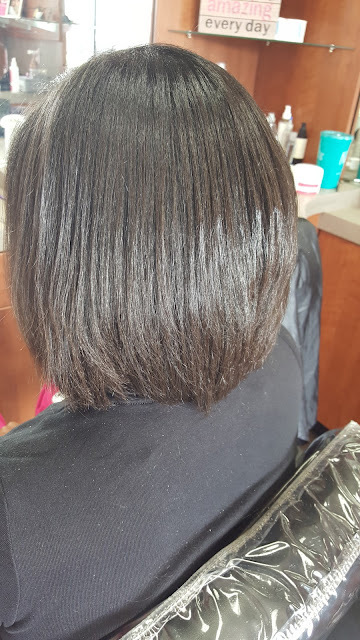 After some reassurance from me she went ahead and did it but one piece of advice I would have is that if your natural hair has grown to your shoulder or longer, go ahead and cut the rest of the relaxed hair off. 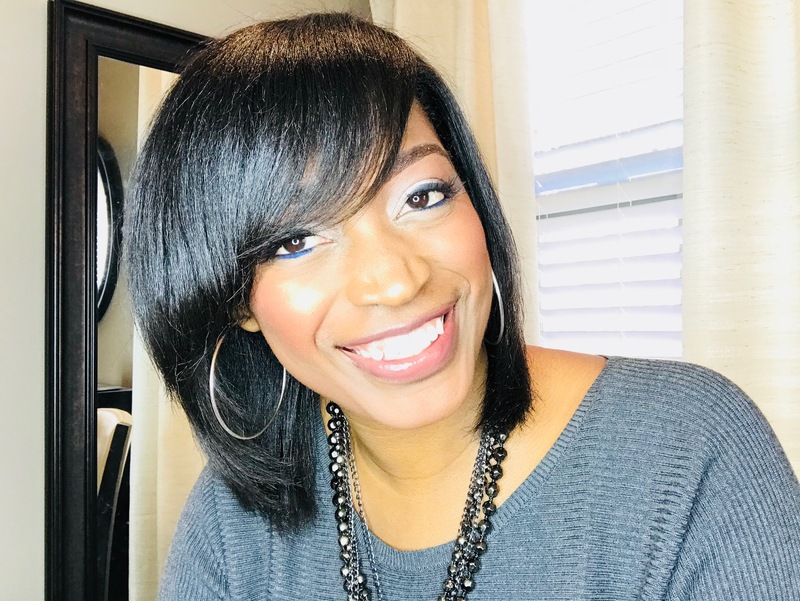 I know that when you had your relaxer your hair was almost bra strap length so cutting to your shoulders almost makes you feel bald but trust me, it will be fine! You will still be able to pull it up if you need to. Once I cut this client's hair, she immediately said that is was not bad at all! Every transitioning woman will get to that point where they are just tired of having relaxer on the ends. Once you reach that moment, go ahead and cut the rest off. Remember that while transitioning the ultimate goal is to eventually become 100% natural so holding on to relaxed ends is only stopping you from getting to that goal. And as an added incentive, this client's hair looked so much healthier when we got the remaining relaxed ends off. It had more body and moved better, and simply overall looked better!